Since a few days ago I finished working on my collaboration with Eric Nocella Diaz of Argonaut Resins and Lord Mesa on their Kalua Moola. 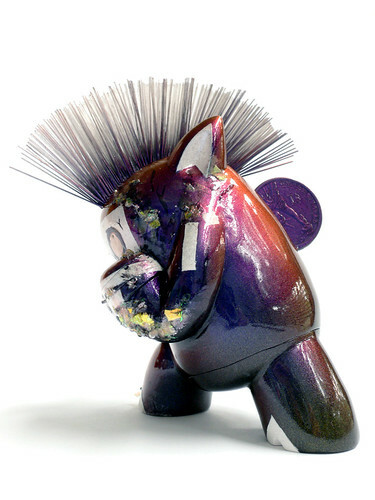 My custom turns the “Recession Agression” version into a Netzwerk pest called “Mohawk Kid”. These gang members can be often seen in the seedier areas of the Netzwerk and are distinguishable by their use of glowing hair and eyes and the scars from many fights and their constant drug abuse. Cheap color shifting skin is also quite popular among these. 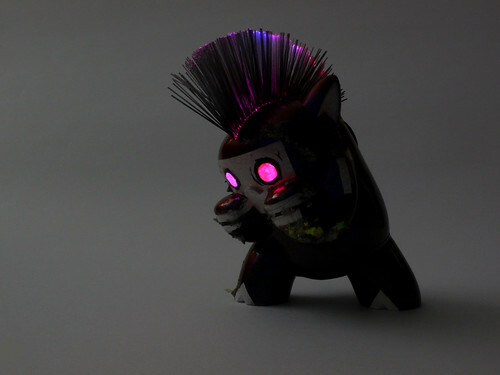 This one off piece was made of a resin toy about 4″ high and modified with an internal battery powered LED circuitry and optic fibers. The light switch is hidden under the coin in the back. Pushing the coin up towards the mohawk activates the LEDs. The battery is replaceable. Available at the Argonaut Resins Online Store for mere $158. Includes a header card signed by Lord Mesa and Eric Nocella Diaz, a small vinyl Netzwerk logo sticker and a hand drawn original header card by me.